Users will pay a monthly or yearly fee to access TextExpander snippets on the Mac, iPad, iPhone, and even a beta app for Windows. Smile Software is changing practically everything about TextExpander except what TextExpander actually does: Letting you save chunks of text or other data as “snippets” that are automatically inserted when you type an abbreviation. The new version of the beloved utility is aimed at more seamlessly sharing snippets among teams, there’s a new web portal at TextExpander.com to manage your snippets online, and it’s even expanding to a new platform with a beta version of TextExpander for Windows. But the other big change is to the purchase model. Previously, you paid for a TextExpander license up front, with upgrade pricing available if you already owned a previous version. With the new TextExpander, Smile is moving to a subscription model with two pricing tiers. After a free 30-day trial, the “Life Hacker” plan is $4.95 a month, or $47.52 per year (which drops the monthly cost to $3.96). You’re required to have a TextExpander.com account, and you can sync your snippets to all devices and share them with other TextExpander users. That should work for most people, but companies can step up to the “Team” plan. That’s $9.95 per month per user, or $95.52 per year per user. The Team plan adds organizational control over which snippets are shared with whom, managing team members and permissions, and so on. Smile’s new TextExpander site makes a great case for using the service for business—you could keep customer-service responses consistent and current among multiple coworkers, share snippets of code or HTML, make sure everyone has the correct spelling of a particularly tricky name, and so on. With both plans, the apps themselves and all updates are free, so Smile can roll out new features whenever they’re ready instead of all at once. 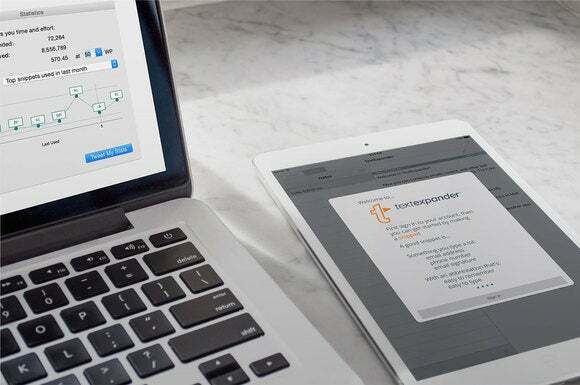 Previous versions of TextExpander are still supported, just no longer sold, and Smile’s PR manager said in an email that the company “won’t be focused on retrofitting older apps” if future OS updates should break them in any way. So if you have TextExpander 5 or earlier for your Mac, for example, and you’re happy with it, you can keep using it as long as it keeps working with OS X. The new Mac app, which we’ll have a full review of soon, has a slightly different skin but the same features in the same places as in previous versions. The biggest difference is that you must sign in with a TextExpander account, and all your snippets are automatically uploaded to Smile’s servers. If you’re already using TextExpander, the new app will find the snippets stored locally on your Mac, import them, and upload them. You can see a log of all the changes the Account pane of the app’s preferences. But there’s no option to say “Nah, I’m good, just store them all locally please” if you plan to only use TextExpander on a single machine. Smile uses https for all its apps and its website, so your data never passes unencrypted over local networks or the Internet. But it does store the data as plain text on its cloud servers, so you probably don’t want to store snippets for your Social Security number or account passwords. For now, all the sharing is done in a browser app. You can organize your snippets into groups inside the Mac app, but the new snippet-sharing features are all managed in your browser, by logging in at TextExpander.com. People were already sharing TextExpander snippets before, but it was clunkier. 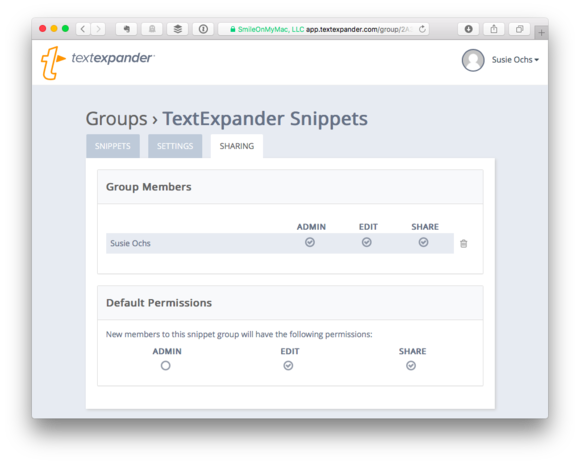 The new version lets you invite people by email address (they’ll need their own TextExpander.com accounts and subscription plans, of course), and then specify which snippets are shared with whom, including permissions to edit them or share them further. Stay tuned for more on TextExpander’s new pricing model, as well as a full review of the new apps and sharing service.